In North America we have been thinking about the concept of Responsibility in our lives, a theme that was launched as part of our child-led worship. We first thought about examples of responsibility in the world, then examining responsibility in school. As a group, we linked the idea to our school values of Love, Serve and Trust. 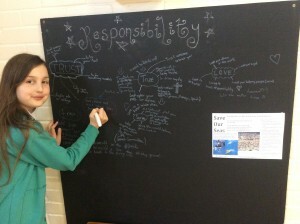 Children were invited to add their opinions to our Chat Board (a place where we can respond to worship themes). After this, we looked at how other children around the world are demonstrating responsibility. 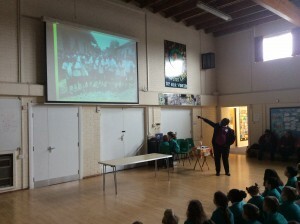 One example was how a group of school children had managed to get plastic straws banned from their community. We then reflected on how we can show responsibility and make a difference to the world. Many children got together to come up with ways in which they could do this. One way that we have been able to show responsibility was when the Bishop of Goma City in the Congo visited us this week. We collected many items of stationery to give to him to take back to a special school he helps to run. We wanted to help those children in less fortunate positions as ours, and so took responsibility to make a difference in some way.